The day after we arrived on holiday I was up early (my body clock still hadn’t switched off). 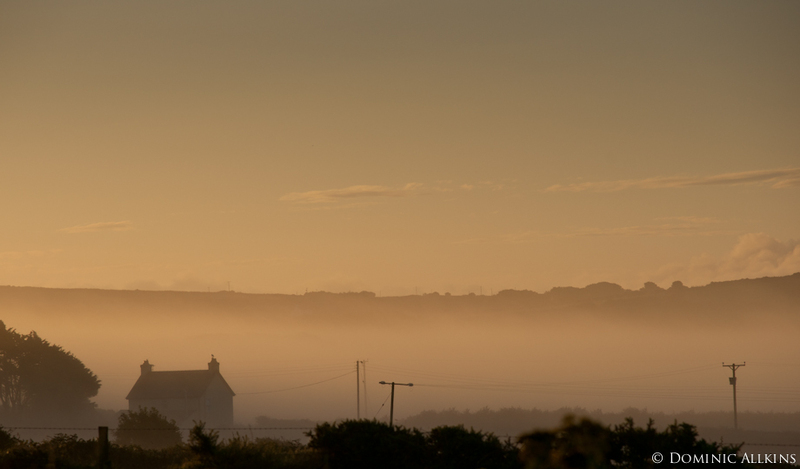 Stepping outside with a coffee to enjoy the sunrise I had a wonderful view of mist rising in the valley from the garden of the cottage. A quick dash inside to grab the camera and here are some of the results. As I mentioned in my earlier post, I had a bit of a panorama frenzy while I was away. The image below is a stitch of seven images taken in landscape on the Sony Alpha 900 with the 70-200G lens at 160mm blended in Autopano Pro software. To see a larger version of the panorama click the link below. The linked image is 3,000 pixels wide so opens in a new browser window. The original stitched version is over 21,000 pixels wide and if printed at 300 dpi would be 1.8m x 30cm (approx). Not sure if I’ll get it printed though – not enough room on the walls and the framing would cost a fortune!! This entry was posted on Sunday, August 29th, 2010 at 20:52 and is filed under Blog, Images. You can follow any responses to this entry through the RSS 2.0 feed. You can leave a response, or trackback from your own site.